he Lyon band's recent collaborations with Virginie Despentes and Béatrice Dalle put them in the spotlight they deserved but this is just the latest chapter of a story started when they were young more than 25 years ago by Eric Aldéa and the drummer Franck Laurino. In the Deity Guns (89-93) and Bästard (93-98) and in a handful of albums (including productions by Lee Ranaldo of Sonic Youth or Andy Briant de Tortoise*), they were simply the pioneers of post-rock in France. The group reformed under the name of ZËRO in 2006 with the arrival of Ivan Chiossone (Eric's accomplice in Narcophony at the beginning of the 2000s). They became a trio for the album "San Francisco" in 2016 with the departure of the guitarist François Cuilleron, already a member of Bästard. This could have limited or even killed ZËRO but instead liberated them. 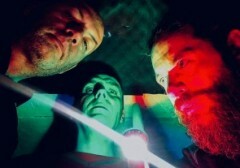 The capacity of the band to renew itself without ever betraying its values will be widely welcomed and although the trio's influences - running from no-wave, industrial music, noise and even alt-jazz - are always perceptible, they have no complexes about sometimes playing moments of real pop. Hordes of gifted but slightly academic apprentices will no doubt bring French post rock into the era of its probable zenith while ZËRO treat us to hot and abrasive James Brown covers in concert and on singles. As if they had nothing to prove. And yet the chapter that arrives today almost resembles the "debut album" of a young band shot through with a fiery and insatiable desire to take on the world. A complex, distressing and oppressive world which is nonetheless rich in its very confusion. "Isn't it all a bit of a mess?" seems to be suggested by the title of this new album "Is not That Mayhem **" and its striking post-apocalyptic graphic art. There are no limits and who cares what tools, sounds and instruments are used? There is trombone on the insistent instrumental We Blew It and even a kind of liturgical organ at the end of Five vs Six. The whole album catches hold of you with its hypnotic layering (Deranged, Myself as a Fool), a chorus in unstable equilibrium (Fake From The Start), an unstoppable rhythm (Marathon Woman walking force), a singular tone of voice (the almost blues-like Alligator Wine borrowed from Screamin' Jay Hawkins), a guitar riff as simple as a tree that hides the forest of variations, advancing from behind to play with neurons and sensations (Recife, 1974 ) ... Just like the old manor that serves as a backdrop to this record, we almost wonder how it all remains standing. *: respectively "Trans-Lines Appointment" de Deity Guns and "Radiant, Discharged, Crossed-off" by Bästard, re-released by Ici d'Ailleurs last spring for the label's 20 year anniversary. **: Mayhem derives from the Old French word mahaigne which meant mutilation.